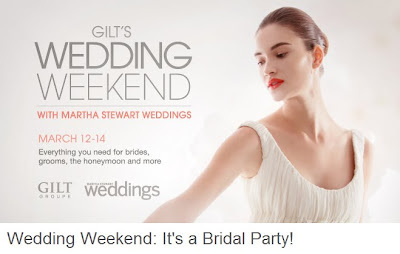 Gilt Groupe in partnership with Martha Stewart Weddings, will be hosting a weekend full of wedding deals (and steals!) this weekend from March 12th-March 14th. If you're a bride interested in some deeply discounted wedding related products from designers including Vera Wang, Carolina Herrera, Amsale, and more, be sure to visit Gilt Groupe's site. There will be bridal dresses, bridesmaid dresses, beauty products and more. You need to be a member (membership is free!) and if you are not, you can site up through my invite HERE.